100s More. 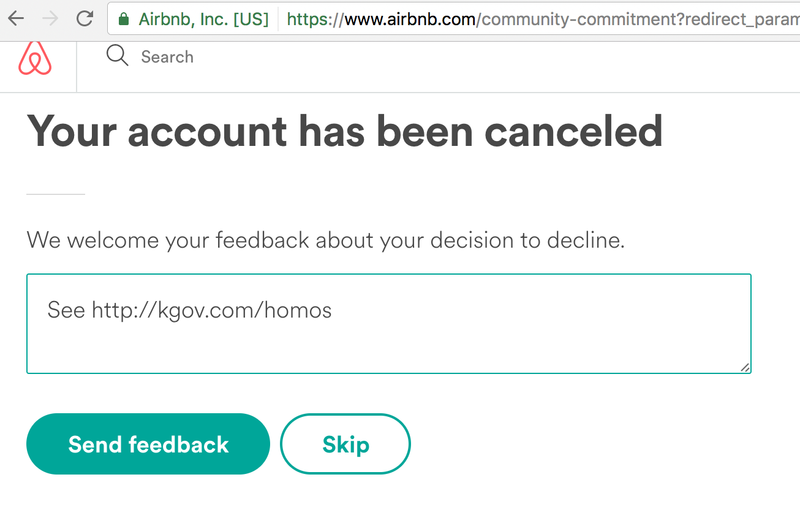 Under the guise of not discriminating, Airbnb is requiring that their customers and hosts affirm homsexuality and transgenderism "without judgment" or Airbnb will cancel their accounts. So, as Olasky and Bob separately say they heard from Airbnb that "Your Airbnb account will be canceled and your future reservations will be canceled." So, the leftists running this service are discriminating against those with "strong religious beliefs" as their website's Q&A section describes us, and denying us accommodations, which is ACTUAL DISCRIMINATION that is also in violation of countless federal, state, and local ordinances. Their "values" claims to oppose discrimination also for "religion", but are they going to tell us with a straight face that Muslims can't make Airbnb reservations unless they are "without judgment" against homosexuals. Right. Hypocrites.